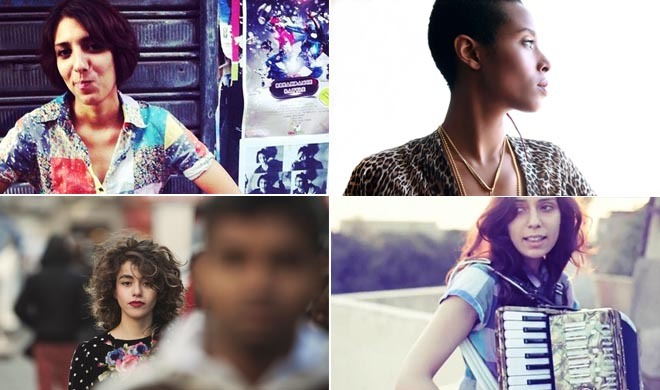 The Middle East has a new generation of female musicians, with novel sounds, voices and a great deal of talent. Your Middle East met four of them to find out how music unites them despite different origins, beliefs and cultures. Although two are Egyptian and two Israeli, these artists have something in common: talent, passion, a rich background and a peculiar sound. We asked them the same questions: their personal history, what is the main character of their music and how they promote themselves, their inspiration and models and if they think a new day has come for women in music in the Middle East. Their answers reveal four young inspired women, aware of their talent and far from any conformist style. Youssra El Hawary is the girl with the accordion who in 2012 conquered the Egyptian and international audience with her song “El soor” (the wall). An Egyptian born in Kuwait, she learned piano, music theory and composing at a young age. Holding a BA in Fine Arts, she studied Design for Cinema and Theater and was an actress and singer for Al Tamye Theater Group. El Hawary talks about how the social networks are the real revolution of this age, not only in music. We no more depend on tv to get news about other nations, she says, we simply talk together, watching pictures and videos by other people and we discover we are not really as different as they want us to believe. “In music, this freedom of communication helped a lot of artists to speak out… you don’t go through censorship, you don’t have to follow commercial plans, you simply use your tools and post your art and what is good is good, and the success you make is very honest and true,” she says. “If people like what you do, they listen, they share and attend your concerts. There is no ‘making a star plan’ behind you,” says the El Hawary, who like jazz, folk and country. “I think when it comes to an artist, the character is very important, that’s why I love Nina Simone and Joan Baez, but also simple and catchy melodies of the Beatles. Then I love Muhammed Abdel Wahab and I admire Bjork”. She says that these days there are many female artists who really speak out. “Female singers have always been there in Arab music history, but they were usually singing others writers’ songs. Now in the underground scene many girls run their bands, composing their songs, expressing their personality,” she says and names Maryam Saleh, Dina El Wedidi, Maii Waleed, and Aya Mitwally as a few examples. “I personally don’t find it hard being a woman in music, but it’s hard as an independent artist, weather a male or a female; we always have to find other ways to get money. But at the end it is a choice. You choose to be independent, so you don’t have someone to control your art and you are free”. Maii Waleed, 25 years old, is from Alexandria, but she settled in Cairo three years ago to study cinema. Since she was very young she was into dancing and singing, with an early and natural talent to create melodies and songs. She started writing Arabic lyrics when she was 17, and her first song was for a short film called “Gozor” by Mohamed Salah. She’s definitely more into the Brit pop style, far from the folkish hints of El Hawary, and she has recently collaborated with the Lebanese musician and producer Zeid Hamdan. “He is a great friend of mine, that I trust and appreciate. Our project is spontaneous and genuine. We both share a similar approach to music, though he’s more experienced. He encouraged me to do this album freely because he’s so natural and receptive. Waleed says that she is not really promoting her music, since the way music is promoted nowadays affects the artist negatively. “So I’ve recorded my songs and just put them out on Youtube or Soundcloud and then people share them in a natural flow. Internet is a great medium, but things get ruined by a lot of consumption. You might be interested for a while but as things get viral they lose their value… I try to keep myself stable, away from this frenzy”. She’s proud of her artistic independence, but a bit critical of the situation for women in general in Egypt. Ester Rada’s African roots are strong; the cross-cultural sound is a reflection of her Ethiopian heritage. Growing up in a highly religious Jewish family in modest conditions in Tel Aviv gave Rada the drive to change her way of life and fulfill a dream of creating music, combining Ethio-jazz, funk, soul and r&b. A big fan of artists such as Nina Simone, Ella Fitgerald, Corinne Bailey Ray, NNeka, Lauryn Hill, Erykah Badu and Jill Scott, Rada is promoting her music through all the social media networks: Youtube, Bandcamp, Soundcloud etc. She does not experience any problems being a woman and an artist. “Israel is a democratic and mostly secular country where women have the same rights as men. I’m not sure it is the same in other neighbouring countries, but there is definitely a new generation of amazing women talents in Israel and all over the Middle East”. Riff Cohen’s greatest source of inspiration is her grandmother Fortunée, who was an illiterate woman from the Tunisian island of Djerba. A tiny brunette from a francophone Jewish family, born in Israel with Tunisian and Algerian blood, she has been composing her own songs since the age of 8. Cohen mainly sings in French and spent many years in Paris. She currently lives in Tel-Aviv. She has great use of social networks and started with a video on Youtube, which was a great success and gave her a lot of confidence. “My audience is international. There is a big interest from different countries. In France, for instance, people like my songs both in Hebrew and Arabic, while in Israel people appreciate my French songs!” she says, noting that there is good music all over the Middle East, it’s just that the Western world don’t know much about it. “It’s a different musical language”.